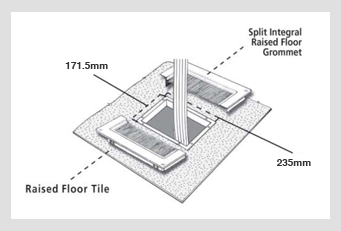 Sealing openings in a raised floor is critical to control your computer room airflows. It is estimated that 50-80% of valuable conditioned (cooled) air does not reach the intakes of your IT equipment due to unsealed floors and openings. In which case cold air is then re-circulated into the cold air reservoir beneath the raised floor, or directed straight into the hot air return streams. This contributes to room hot spots and cooling unit inefficiencies, increasing infrastructure costs. Can be retrofitted in existing cable hole cutouts. 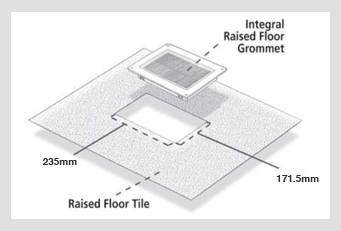 There are many different floor sealing system sizes to get the right product for you. Please contact our sales team with your hole size cutout for pricing. IT equipment is cooled by drawing cold air through the front of the unit and expelling the exhaust air from the rear. If this hot exhaust air is allowed to re-circulate back to the inlet of the equipment, overheating will occur. Preventing the unwanted mixing of the air in the cabinets will improve the delivery of cold air to the active equipment. This method will also stop airflows bypassing the equipment. 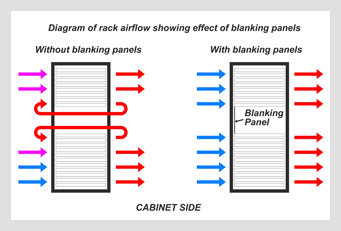 A simple and effective method to prevent air re-circulation within the cabinets is to install blanking panels. This strategy reduces hot spots and saves energy by increasing the air conditioning return air temperatures. As with blanking panels, using infill panels in 800mm wide cabinets is also important. Having a 200mm space within the cabinet allows a lot of cold air to bypass the equipment. Our infill panels are available in standard U heights 6u, 12u and 24u and are tailor made to each customer's width specification. (Please note that some active equipment feeds the cold intake air from the right hand side of the units and delivers the hot exhaust air to the left. In cases like this, fitting a full height infill panel to the left hand side of the cabinet will stop the hot exhaust air re-circulating back to the air intakes). These are manufactured from robust high grade aluminium extrusions and are available with two damper types, depending on frame option. Screwdriver operated slot dampers, formed from opposed sliding plates, are the preferred option and are available on the standard frame. Engineered to close tolerance for smooth, silent operation these discreet dampers are position lockable and are completely enclosed within the grille body, making transport and handling much easier, as well as reducing cost. Opposed blade dampers are also available on all frame types with a choice of standard steel construction or aluminium. Aluminium opposed blade dampers can also be specified with a locking screw to prevent tampering.